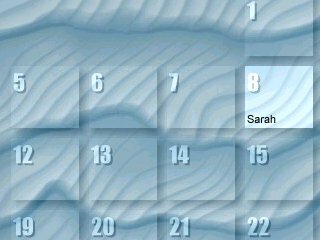 The WaterWall desktop calendar tells you quickly what importantant dates or bithdays wait for you this month. 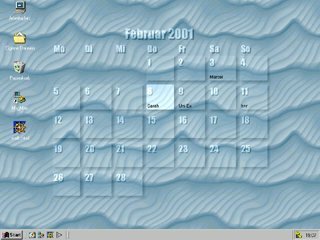 The layout of the calendar can be adjusted in many ways and hidden if you like to admire your desktop image without it. The highlited rectangle points to the current date. 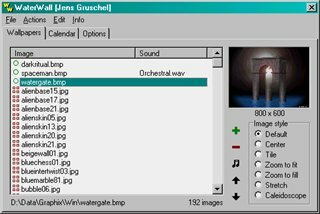 Whenever a term is reached you are notified by a user defined sound or an alarm popup window. 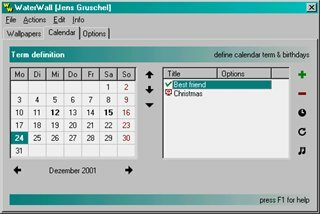 On the calendar sheet you can add birthdays and other terms, configure the single terms (sound? type? alarm?) or delete them again. WaterWall can delete past terms automatically if you wish, so your calendar is always up to date.